The Energy Policy Act of 2005 created the Energy-Efficient Commercial Buildings Tax Deduction (CBTD) to encourage owner investment in energy-efficient building systems. The CBTD establishes a special tax deduction rewarding investment in energy-efficient interior lighting, HVAC/hot water systems and building envelope, subject to a cap of up to $1.80/sq.ft. It’s an accelerated tax deduction, meaning the owner can potentially write off the entire cost of the new systems in the tax year in which it is placed in service, instead of capitalized and depreciated or amortized over time. Instead of installing all three types of building systems, the designer can focus on one, such as interior lighting, and earn up to $0.60/sq.ft. These approaches require energy modeling. A simpler approach, which does not require special qualified software or energy modeling, is the Interim Lighting Rule, which will be the focus on this article. Note this industry incentive is set to expire on December 31 of 2013. As of the time of writing, the only effort to continue the CBTD is the Commercial Buildings Modernization Act, introduced in the Senate, which would extend it through the end of 2016. The incentive would be larger, and it would include outdoor lighting as well as indoor. However, it would be much harder for new lighting systems to qualify for the CBTD under the Act as it is currently written, as the new system would have to achieve a higher standard of savings. And with little support among Republicans, it is highly uncertain whether the bill will be signed into law. The Interim Rule permits owners of commercial buildings to deduct the full cost of new interior lighting—up to $0.30 to $0.60/sq.ft.—based on achieving 25% to 40% lighting power density (LPD) savings than the maximums allowed by the ASHRAE/IES 90.1-2001 energy standard. These LPD values, expressed in W/sq.ft., are prescribed for building (Table 9.3.1.1) or space types (Table 9.3.1.2, not including additional power allowances). The actual maximum CBTD that can be earned is based on the design LPD reductions shown below. The exception to the sliding scale is warehouses. The interior lighting must be reduced in LPD by at least 50% to earn a CBTD of up to $0.60/sq.ft. For example, in ASHRAE/IES 90.1-2001, the maximum allowable lighting power for office buildings is 1.3W/sq.ft. If a new lighting system achieves 0.9W/sq.ft., which may be achievable using current lamp and ballast technology, then 30 percent LPD savings are estimated, which yields a maximum CBTD level of $0.40/sq.ft. If the new lighting system has a deductible cost of $50,000, the space is 100,000 sq.ft. and the maximum CBTD level is $0.40/sq.ft., then the owner could deduct $40,000 during the tax year the lighting is placed in service, and depreciate the remaining $10,000 as it normally would. Utility rebates impact the deductible cost; if a utility rebate of $10,000 were provided to this project, the CBTD would cover the entire cost of the project: $40,000. The result is the economics of investing in a new interior lighting system may become more attractive to the owner, incentivizing approval. Otherwise, however, note the goal of the CBTD itself is to achieve a lower LPD than the 90.1 standard, not the current lighting system that will be upgraded. The existing lighting system is relevant only in the economic analysis presented to the owner for approval. For the purpose of the CBTD, the existing lighting system is irrelevant. Bilevel switching must be installed—which may be A/B, step dimming or continuous dimming—in all occupancies except hotel and motel guest rooms, store rooms, restrooms, public lobbies and garages. The project must achieve minimum recommended calculated light levels prescribed in the Ninth Edition of the IES Lighting Handbook. Additionally, if more than 50 percent of the light fixtures are replaced in the project and the controls are replaced, then ASHRAE/IES 90.1-2001’s mandatory Space Controls requirements must be met. The project must be in the United States or its territories. Qualifying building types are listed in Table 9.3.1.1, which IRS Notice 2008-40 expanded to include nonresidential unconditioned garages. Houses of worship, while listed in Table 9.3.1.1, do not qualify because religious organizations are tax exempt. Multifamily rental housing qualifies as long as the building is four stories or higher. Public buildings such as government, schools, etc. cannot earn the CBTD but may allocate it to the primary designer(s) of the interior lighting. IRS Notice 2008-40 defines the designer as the “person that creates the technical specifications for installation of energy-efficient commercial building property.” If more than one designer is involved, the owner may allocate the CBTD however it sees fit—to the primary designer or at the owner’s discretion among the designers. As lighting management companies often specify retrofit lighting projects in public building projects such as schools, this presents good opportunities to maximize income. If a building has multiple building types within its structure then the building types can be treated separately or combined, with power allowance tradeoffs permitted between the building types per the Building Area Method in ASHRAE/IES 90.1-2001. Alternately, the Space by Space Method could be used, which breaks the building down into a collection of space types, with tradeoffs allowed between spaces. In all tradeoffs, the sum of the lighting power cannot exceed the interior lighting power allowance. 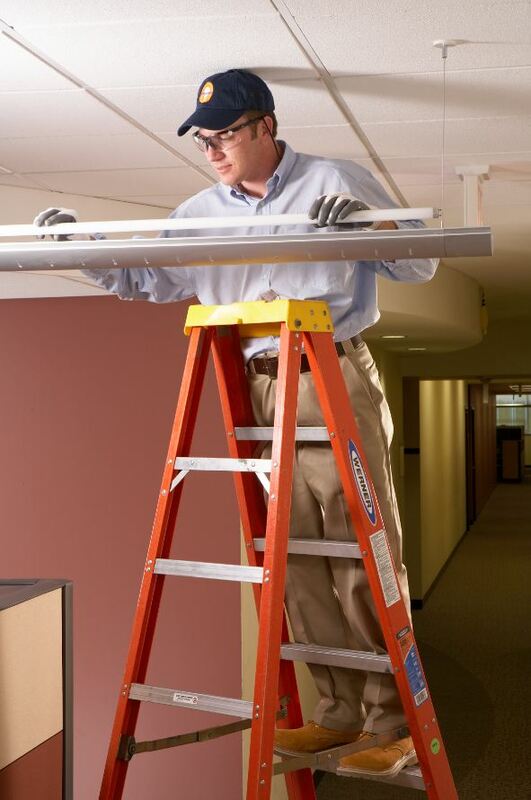 The lighting must be permanently installed, so portable task lighting does not contribute to CBTD qualification. ASHRAE/IES 90.1-2001 exempts exit signs from interior power calculations, so exit sign upgrades do not contribute either. In both cases, however, good energy savings may result, so the upgrades nonetheless should be considered. Alternately, a ballast could be specified with a custom ballast factor that tunes light output and input watts at the ballast, not the lamp. At a minimum, lamps and ballasts must be replaced or new fixtures installed; a simple lamp retrofit (e.g., an upgrade from incandescent to screwbase compact fluorescent lamps) would not comply because the installation is not permanent and the resulting expense is considered a maintenance and not a capital expense for tax purposes. For a building owner to claim the CBTD, the project must be certified by a qualified individual—a contractor or engineer properly licensed as such in the jurisdiction where the building is located. The individual, who cannot be an employee of the building owner, must demonstrate in writing to the owner that he or she has the qualifications to do the certification. The National Electrical Manufacturers Association (NEMA) has published a series of sample certification letters on its CBTD website: http://www.lightingtaxdeduction.org/tax_deduction.html#P9. a statement by the qualified individual that the interior lighting systems have been, or are planned to be, incorporated into the building that meet all of the requirements of the Interim Lighting Rule. these inspections confirmed the building is meeting the specified reduction in lighting power density. Note that although IRS Notice 2006-52 says the certification must include a statement that qualified computer software was used to calculate energy and power consumption and costs, this is not needed to demonstrate compliance with the Interim Lighting Rule. Instead, a spreadsheet or similar software can be used. This is the last year the CBTD will be in effect in its current form, offering a potentially valuable tool to help make lighting retrofit projects more economically attractive. If the Commercial Buildings Modernization Act introduced in the Senate is passed as written today (as of the time this article was written), the maximum CBTD amount would increase and exterior lighting would be covered, but the reference standard would transfer from ASHRAE/IES 90.1-2001 to 2004/2007, which is much tougher to beat. And again, given the current state of Congress, there is a great deal of uncertainty about whether it will become law. For more information about the CBTD, visit www.lightingtaxdeduction.org.